Also: this weekend the manhunt for two prisoners who escaped June 6 from an upstate prison zeroed in on a southwestern New York area, Allegany County. The search continues and the situation is fluid. 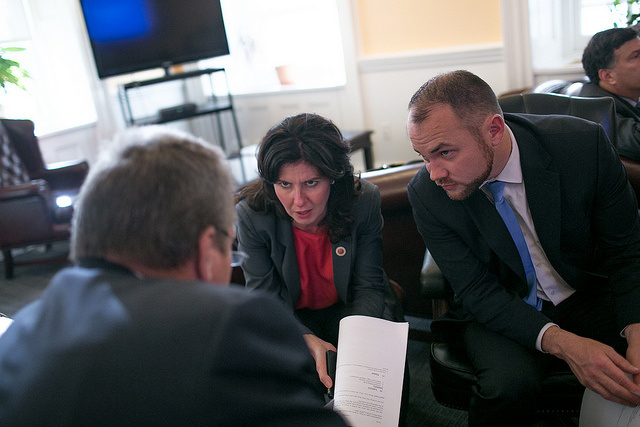 TRACKING DE BLASIO: Mayor Bill de Blasio is no doubt uneasily watching Albany and in touch with key players in state government - he has said repeatedly of late that his staff is in consistent communication with the governor's office. The mayor is most concerned with the rent laws, mayoral control of city schools, the 421-a tax break, and perhaps a few other key issues related to the city (like the charter school cap and 'raise the age') that may get resolved as the extended session continues. On Saturday de Blasio delivered remarks at the street renaming ceremony for Detective Rafael Ramos in Brooklyn and then attended and gave remarks at "the #IamAME Rally and Response hosted by the Greater Allen A.M.E. Cathedral of New York [in Queens] to address the unparalleled tragedy at Emanuel A.M.E. Church in Charleston, South Carolina this week." 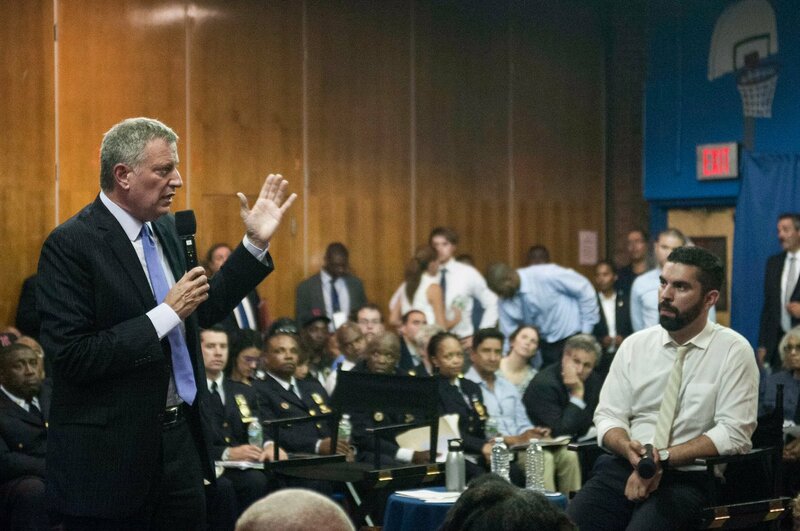 De Blasio spoke about racism, terrorism, and the need for stronger gun control laws. On Sunday, de Blasio hosted a press conference in Harlem "to discuss the humanitarian situation concerning Haitians and Dominicans of Haitian descent in the Dominican Republic." On Sunday evening, city leaders including Brooklyn Borough President Eric Adams and Public Advocate Letitia James, and others were set to gather outside Brooklyn's Barclays Center for a vigil honoring the victims of the Charleston shooting. On Monday, the mayor will appear on Hot 97 radio at about 7:30 a.m. (read this for some context) and, later in the day, he'll "attend the Department of Education's Renewal Schools Working Session" - all this while he and his team continue to negotiate a final city budget deal with City Council Speaker Melissa Mark-Viverito and her budget negotiating team. 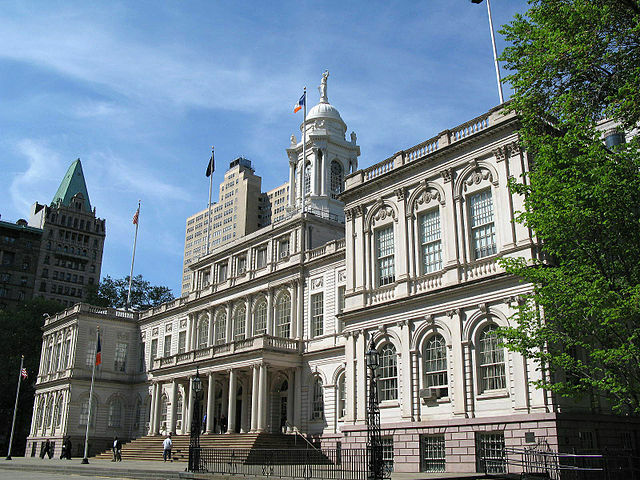 CITY BUDGET WATCH: A fiscal year 2016 deal between the de Blasio administration and the City Council is due before July 1, when the fiscal year begins. 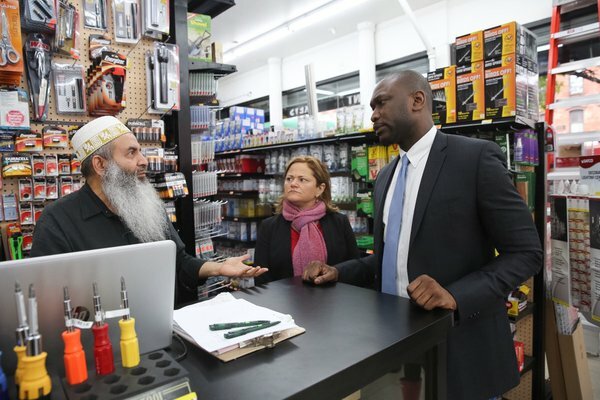 Last year, Mayor Bill de Blasio and Council Speaker Melissa Mark-Viverito announced they had reached a deal on June 19, and there's good reason to think they could again reach a deal a before the deadline this year - which could mean an announcement this week. Stay tuned! The big issues still being negotiated include Council requests for additional funding for an additional 1,000 NYPD officers, senior citizen services, libraries, and more. RIKERS DEAL? : The City and the US Attorney's Office appear close on a deal of reforms at Rikers Island jail complex, incuding a federal monitor to track changes in prisoner treatment and more. There has been more and more scrutiny on both Rikers and related criminal justice issues, like how the bail system works, or doesn't, leading to thousands of people locked up on Rikers who are accused of low-level, non-violent crimes but can't afford the bail set for them. The fourth and final public meeting of the Fast Food Wage Board called by Gov. Cuomo, through his labor department, will be at 10 a.m. Monday in the Legislative Office Building at Albany (and webcast live). "The Wage Board's recommendations are expected by July, and the commissioner will then have 45 days from its receipt to issue an order." Opposing views: The Business Council of New York State will "submit formal comments, and testify in person, at the June 22 meeting in Albany, NY." The Business Council first announced its objections to the fast food Wage Board on June 5. Meanwhile, hundreds of $15 per hour supporters, including fast food workers and their families, elected officials including State Senator Neil Breslin, and others will hold a 9:30 a.m. press conference at the Legislative Office Building in Albany. At 10 a.m. Monday, City Council Speaker Melissa Mark-Viverito will be one of the commencement speakers at the Young Women's Leadership School of Brooklyn's first graduating class' commencement. At 10:30 a.m. Monday in Garden City, New York, "Attorney General Eric T. Schneiderman will announce the start of a statewide advertising campaign to educate consumers about how to protect themselves against mortgage rescue scams." 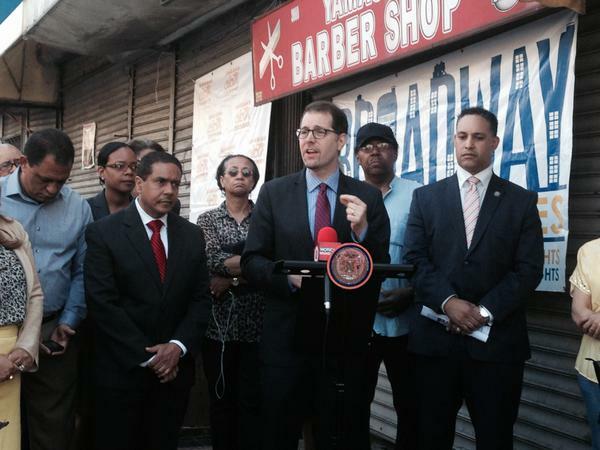 Monday morning Council Member Costa Constantinides, Public Advocate Letitia James, and others will be holding a press conference urging a management company to make repairs on the lack of gas and hot water at a co-op complex in Astoria. At 9:30 a.m. the Subcommittee on Zoning and Franchises will meet to discuss three land use applications. At 10 a.m. the Committee on Youth Services will meet to have an oversight hearing on how to better address the issue of youth violence. At 11 a.m. the Subcommittee on Landmarks, Public Siting and Maritime Uses will meet to discuss three landmark land use applications. At noon, the Committees on Higher Education, Community Development, Youth Services and Immigration will have a joint meeting to discuss how New York City is doing on educating its adult immigrant community. At 1 p.m. the Subcommittee on Planning, Dispositions and Concessions will have a meeting to discuss two land use applications. On Monday, City Comptroller Scott Stringer will deliver remarks at a 5th grade graduation ceremony at 9:30 a.m. and in the evening, at 7:30 p.m., he'll accept an award at the Council of Jewish Organizations of Staten Island 48th Annual Dinner and Awards Reception. At 5:30 p.m. Monday there will be a public meeting of the Contracts Committee of the Panel for Educational Policy. The Contracts Committee meets before the Panel for Educational Policy meetings to "review specific contract items that are presented for review and approval." Monday evening, Manhattan Borough President Gale Brewer "speaks at the LGBT Community Center's 32nd annual garden party kick-off for Pride Week." On Monday a "Town Hall for Immigrant Businesses" will be held in Flushing, Queens by the Mayor's Community Affairs Unit starting at 6 p.m. Speakers will include Commissioner of the Department of Small Business Services, Maria Torres-Springer; Deputy Commissioner of the Department of Consumer Affairs, Amit Bagga; and Magda Desdunes from the Department of Health. At 8 p.m. Monday in front of the Queens Museum, "Borough President Melinda Katz, District Attorney Richard A. Brown, elected officials, community leaders and advocates will host a borough-wide interfaith prayer vigil for the victims of the Charleston massacre and a lighting ceremony in solidarity with New York State gun violence awareness efforts. The ceremony will include a reading of names of New Yorkers in Queens lost to gun violence. Every night from June 22 through June 30 in "The World's Borough", the front exterior of the Queens Museum will be illuminated in orange, the official color of Gun Violence Awareness Month, and will be visible by all motorists along the stretch of the Grand Central Parkway in front of the Museum (approximately 168,000 motorists daily on average)." The state Legislature is due back in Albany on Tuesday, which is when the brief retroactive rent laws extender will expire. Will there be deals in place by Tuesday whereby votes are a formality or will there still much negotiating to do? On Tuesday at 10 a.m., the New York City Landmarks Preservation Commission will be holding a public hearing and might vote on designation of the Stonewall Inn at 51-53 Christopher Street. It would be the first "LGBT landmark" in New York City. At 10 a.m. the Committee on Civil Service and Labor will have a meeting to discuss the establishment of a retirement security review board to study and report on recommendations for the city to establish a retirement security program for private sector workers. Also at 10 a.m. the Committee on Public Safety and the Committee on Mental Health, Developmental Disability, Alcoholism, Substance Abuse and Disability Services will have a joint meeting to discuss a bill that "would create the office of drug strategy to provide strategic leadership to coordinate a public health and safety approach to address problems associated to drug use and redresses the harms associated with past and current drug use." In addition, the committees will discuss examining NYC's response to heroin use and overdoses as well as a resolution recognizing and honoring the 25th anniversary of the 7/26/90 signing of "The Americans with Disabilities Act" of 1990. On Tuesday at 1 p.m. the New York City Bar and Public Advocate Letitia James will host a program, "Policing Technology in New York City: Privacy, Law, and the Future," to discuss the technological advancements made available to New York City law enforcement and the importance of oversight and safety. Speakers will include Lawrence Byrne, Deputy Commissioner of Legal Affairs at the NYPD and Ben Rosenberg, General Counsel to Manhattan DA Cy Vance with Asim Rehman, General Counsel to the Office of the Inspector General for the NYPD as moderator. The New York City Campaign Finance Board is offering a "Compliance only" training session, which covers campaign finance laws and CFB rules for the 2017 election cycle, at 5:30 p.m on Tuesday. "The candidate, treasurer, campaign manager or other individual with significant managerial control over the campaign is legally required to attend both a Compliance and a C-SMART training." On Tuesday at 6 p.m. the Department of Education will hold a public meeting of the Panel for Educational Policy at Long Island City High School. The 2015-2019 five year capital plan amendment, the annual estimate and the list of contracts will be voted on. Also at 6 p.m. Comptroller Scott Stringer will host an "LGBTQ Pride Celebration and Changemakers Award Ceremony...honoring individuals for their outstanding contributions to the LGBTQ community" in Manhattan on Tuesday night. The University Neighborhood Housing Program will host its annual forum at 8:30 a.m. on "The Cost of Water: Balancing Fairness, Housing Affordability and Conservation." UNHP's report "Affordable Water for Affordable Housing" will be discussed by panelists including Jim Buckley of UNHP, Laurie Schoeman of Enterprise Community Partners and Jamie Stein of Stormwater Infrastructure Matters Coalition. On Wednesday morning at Baruch College the AARP will be releasing a "groundbreaking NYC survey on the financial security and retirement savings crisis facing the city's Gen X and Baby Boomer generations," with City & State NY. Speakers include: Joyce Rogers, Senior Vice President and AARP National Representative and John Adler, Director of Mayor's Office of Pensions. 10 a.m. Wednesday morning, the New York City Campaign Finance Board will be having their next public meeting. An agenda will be made available on Tuesday and posted to its Twitter feed, @NYCCFB. At 10 a.m. the Committee on General Welfare will meet for an oversight meeting over the services and policies at the HIV/AIDS Services Administration. At 11 a.m. the Committee on Land Use will meet to discuss land use applications. At 2 p.m. the Committee on Health will meet to discuss a new law that would require the department of Health and Mental Hygiene to conduct community air quality surveys and publish the results annually. The New York City Campaign Finance Board is offering a "C-SMART only" training session, which will provide "an overview of the CFB's web-based application which campaigns must use to manage and disclose financial activity" for the 2017 election cycle, at 5:30 p.m. on Wednesday. "The candidate, treasurer, campaign manager or other individual with significant managerial control over the campaign is legally required to attend both a Compliance and a C-SMART training." At 6 p.m. on Wednesday, the New York City Rent Guidelines Board will be at Cooper Union for its last public meeting this cycle. After four previous meetings with public testimony a final vote on rent guidelines for October 1, 2015 through September 30, 2016 will be taken at this public meeting. On Thursday at the City Council: At 1 p.m. the Committee on Environmental Protection will meet to discuss a bill that would mandate construction sites within 75 feet of any school (public, private, preschool primary or secondary) should not exceed 45 dB during normal school operating hours and that noise levels at school sites shall be continuously monitored during those hours. Empire State Pride Agenda will host "Equality @Work Awards" on Thursday at 6 p.m. "Through its Pride in My Workplace program, the Empire State Pride Agenda has been helping New York businesses establish policies and practices that support the needs of lesbian, gay, bisexual and transgender (LGBT) employees." Thursday evening in Brooklyn, it is the 2015 Working Families Party Gala, celebrating "17 years of fighting inequality in New York and honor a rising generation of progressive leaders. Friday is the last day for the Fast Food Wage Board to receive oral or written testimony. Written testimony can be mailed or emailed. There will be a Manhattan Borough Service cabinet meeting on Friday at 9:30 a.m. The Borough Service Cabinet meetings focus "on city service delivery and agency responsiveness across the borough." On Saturday morning at 11 a.m. Citizenship Now! and the Mayor's Office of Immigrant Affairs will assist permanent residents with their citizenship applications. If all naturalization requirements are met then an experienced lawyer and other immigration professionals will provide assistance with filling out the forms. The New York City Pride parade will be Sunday at 11 a.m.